To paraphrase a group of exasperated nuns I once heard: How do you solve a problem like Dom and Wendell? On the one hand, one of the two of them is obviously going to win, anyone who goes up against either one of them is doomed to second or third place, and this was probably the last chance to take a shot at one to make sure there’s even a chance they’re both out before final 3. On the other hand, their idols are scary, and they’ve been Laurel’s besties, so how could she turn on them? I am trying to be sympathetic to Laurel here, understanding that a guarantee of final 3 is a tempting offer, and the price jump is pretty big from jury to even third place, but the way she talks through her decision making in confessional is infuriating. She tells us that she knows that there is no way she can beat them, and that she’s aware this is probably her last shot, yet she’s so grateful to them for keeping her around when they could have gotten rid of her earlier, and she just likes them so much, and other sugary reasons that are exactly what I don’t want to be hearing from the only possible strategic threat standing between one of these two powerhouses and an obvious victory to cap off a painfully boring season. On the other end of the spectrum, Donathan is getting restless to make a move. Unfortunately, with Laurel not budging, and Sebastian and Angela being invisibly but apparently firmly locked in with Dom/Wendell for mysterious reasons that we will never find out because they are not allowed to talk, Donathan has little room to maneuver, even with Free Agent Kellyn knowing she’s on the outs and being up for a flip. Combine that with the fact that he was left out of the reward after Dom and Wendell won a truly bonkers challenge as a pair and picked Laurel without so much as heeding Jeff’s suggestion to let each person plead their case to go on the big reward, which involved food and also the allegedly soul-nourishing experience of hanging out with children, which I can only interpret as a punishment but am gathering from context clues that this is something people want. The other pairs for this challenge were Kellyn and Sebastian, and Donathan and Laurel, leaving Angela unchosen and ineligible for both reward and Ghost Island. Gotta say, this is an extremely fit group when powerhouse Angela is left out of a physical challenge. Looking like a mob boss with a toothpick hanging out of his mouth, Wendell sends “the pirate” Sebastian to Ghost Island, leaving Donathan, Kellyn, and Angela, who is herself a ghost in these last couple of episodes, alone at camp. On the reward, Laurel convinces Dom and Wendell that she’s planning to go to the end with them because her best shot is to have the jury split the votes. I guess this is her only play to provide a motive for why she would possibly want to sit next to them at the end and convince them that she’s not looking to flip, except that this plan makes no sense. Two similar candidates splitting a vote and allowing the other candidate to win in an election only works because there are two deeply divided parties with their own loyalties. This plan would make sense if Laurel was certain she had 4 votes locked up, and the other 5 would split between Dom and Wendell, but that makes no sense here unless she thinks they’re going to vote directly along original Malolo party lines, in which case she would have Libby, Michael, Jenna, and Donathan if he’s on the jury, but that seems wildly presumptuous. She tells us in confessional that actually she’s lying to them and is looking to cut them, a deceit that she would be pulling off tremendously except that I think she’s actually not lying to Dom and Wendell and is lying to us in confessional to make it seem like she’s playing strategically when really she’s playing it very safe. To reiterate: I don’t blame her. Third is better than fifth, sixth, or seventh. Maybe she’s correct about the original Malolo votes. I’m just trying to work through my frustration as a viewer, watching someone play what I see as a losing game, given the information I have. Also on this reward, they ask a local woman at their picnic who she thinks is going to win, and they include Domenick saying that she was definitely looking at him, which I can already see in his winner montage at the reunion show. On Ghost Island, our friend Seabass is talking in metaphors and about fish again. He gets the vote steal, the second nod to Michaela this season, but it’s actually double-cursed. 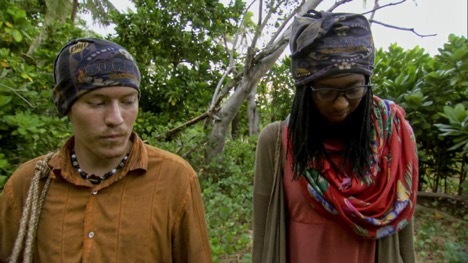 The second curse doesn’t come from Stephen Fishbach, the original cursed vote-steal owner who misplayed it and got voted out that night in Second Chance, but rather it’s cursed by Kellyn, who misplayed it approximately 11 minutes ago two episodes prior, which feels very unfair to poor Kellyn who has been through enough and certainly is not the most egregious misplayer of the vote steal. There is no doubt in my mind that this advantage will loom large and Sebastian will use it to its full extent, leveraging it to change his position in the game whatever way he can. I’m obviously joking, he will not play this correctly, and this will not matter. In the immunity challenge, Laurel will get another crack at the slide puzzle that she took on against Des in the opening challenge of the season, and will come up successful, due to her acute puzzle solving skills combined with her sharp Jeff-hailing skills. Apparently Wendell finished the puzzle first, but expected Jeff to use the chip in his brain that automatically alerts him when puzzles are completed to simply know that his puzzle was done, without signaling to him at all. Wendell’s whambulance-calling and crying on the course is such a weird and bad look that if I wasn’t fully convinced that Dom was winning of these two before, I’m now predicting it without a shadow of doubt. Back at camp, Donathan is going way too hard to rattle the power players, telling Wendell that there’s no way he will vote for him at the end, which isn’t going to win any friends, and prompts Wendell to correctly point out that airing this information will just make Dom want to put him on the jury so he votes for him. He’s generally doing the most and tells Kellyn that Wendell is going to pull an idol because he saw Dom slip him some paperwork, which Wendell wanted to use to brandish a fake idol, which makes no sense because if you have an idol and want to wield it just to scare people off of voting for you, why not just use your actual idol instead of a fake one with paperwork, but I digress. None of this matters because there aren’t enough people to flip on the power couple, but we continue with this charade as if there is any surprise or joy left in this story, such is life. At tribal, Dom is super annoying about how great he is at puzzles, but he’s just too tired to pull it out. Sure. He and Wendell are also annoying about Donathan’s paranoia, berating him for thinking that their secret exchange of some sort of item was game-related, because why on earth would Donathan ever be suspicious of two players sneaking something into each other’s bag and then refusing to say what it is? How dare he question them like that?! These two are truly irritating when they are at their most hypermasculine, shouting and boasting and homosocially bonding over yelling at another person. Ultimately, Donathan almost accidentally votes himself out by voting for Domenick instead of Kellyn, who does vote for him, but he is saved on the revote when the team decides to go against Kellyn despite Donathan’s unpredictability that day. I love both Donathan and Kellyn and as a result found myself almost disinterested in this outcome, knowing that neither of them have a shot at this thing anyway and this was only a matter of time. Kellyn’s final words are cogent and delightful, and I hope she’s proud of herself and that she had fun. She had more of a roller coaster than most people out there, and I’m truly glad I got to see her play.